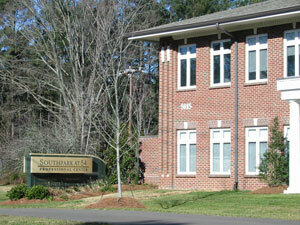 We're located in Southpark at 54 Professional Center. From I-40, take exit 276, and go north across the bridge (away from The Streets at Southpoint mall.) Take an immediate left at the traffic light onto N.C. 54. Drive four-tenths of a mile, then turn right onto Southpark Drive at the sign pictured above. Travel one-tenth of a mile and turn right into the parking lot. Find the row of buildings along N.C. 54. We're on the first floor in the left-most building. See map below.